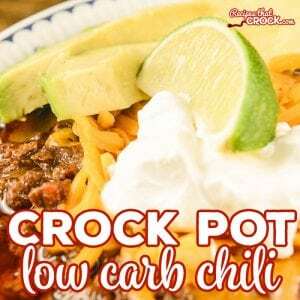 Crock Pot Low Carb Chili - Recipes That Crock! Are you looking for a great low carb chili recipe that is easy to make? 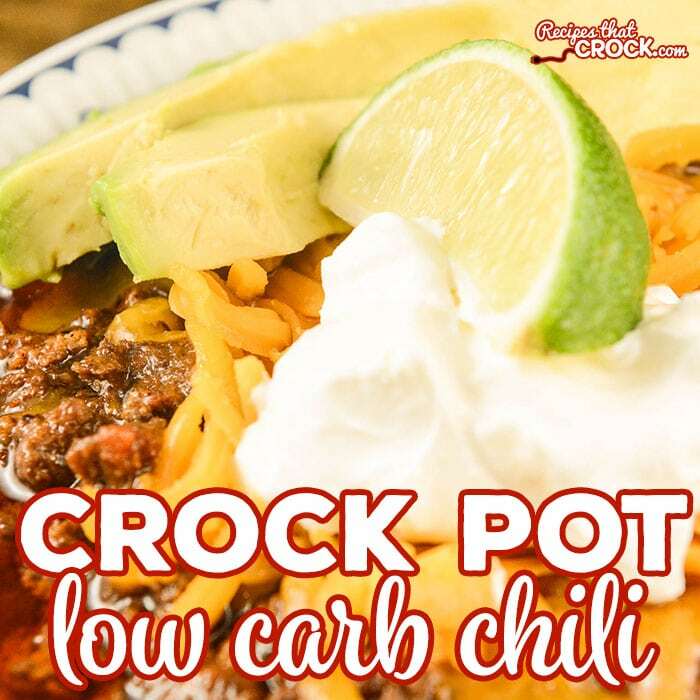 Our Crock Pot Low Carb Chili is a hearty, meaty chili with an amazing smoky flavor that even carb lovers can’t resist! Chili has been one of those recipes that I have been missing a bit as I continue with my low carb lifestyle. But after spending a LOT of time in Texas lately, I fell in love with the flavors I could add to chili and stew with a bit of chilies and some lime and avocado. So I set out to create my dream chili. Now I know many of my Texans are VERY particular on their chili, so let me just say this is “inspired by” the flavors I have found in Texas with a bit of a Hoosier girl twist, because you can take the girl out of Indiana, but you can’t take the Hoosier out of the girl- ha! Now, with that said, if you are looking for more of a Texas-style chili, you may want to check out our Slow Cooker Texas Chili. One of the things I love about this recipe is how easy it is to throw together and the flavor is so smoky thanks to the cumin and poblano peppers. My 10 year old RAVES about this recipe. She absolutely loves it, especially with a nice big slice of avocado– or if you want to get fancy, some of our (super easy to make) homemade guacamole. Heck, you could create a whole little chili bar if you want with all the fixins you family enjoys. So how easy is it to make? All you have to do is brown up that ground beef in a skillet or if you are using a multicooker that has a browning or saute feature, you can use that setting to brown your meat IN your slow cooker. Once your meat is browned, you can drain it if desired (we prefer the extra fat, but others may prefer the end result to not be as oily). Then all you do is add the remaining ingredients and cook on low for 6-8 hours. SO good. I love it topped with cheese, sour cream, avocado and lime. Mikey loves it on hot dogs! I like using my multicooker to cook this up to make it a one-pot meal. Multicookers (like the Ninja) allow you to brown the meat in your slow cooker on a saute setting. If you don’t have a multi-cooker, you can use any traditional 6 quart slow cooker by browning your meat in a skillet first. Are you looking for a great low carb chili recipe that is easy to make? 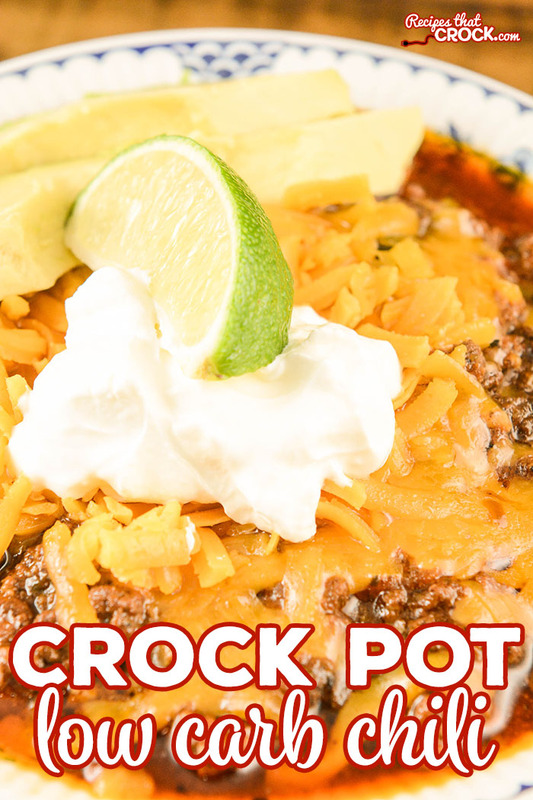 Our Crock Pot Low Carb Chili is a hearty, meaty chili with an amazing smoky flavor that even carb lovers can't resist! Brown your ground beef in a 6 quart multicooker or slow cooker with 1 T Chili Powder, 1 T Cumin, your garlic and onion. Drain if desired (We prefer not to drain, but it does add an oily quality to the end). Add the remaining ingredients except garnish. Stir and and cook on low for 6-8 hours. I like using my multicooker to cook this up to make it a one-pot meal. Multicookers (like the Ninja) allow you to brown the meat in your slow cooker on a saute setting. If you don't have a multi-cooker, you can use any traditional 6 quart slow cooker by browning your meat in a skillet first. I just purchased a Hamilton Beach 4 qt. Slow Cooker. The enclosed pamphlet has a chili receipt that does NOT call for browning the ground beef before putting in the pot to cook. Is it safe to not to brown the ground beef before putting in the crock pot? Health wise it is fine but tends to leave it a bit greasy. I prefer to brown and drain mine first. It might work out better if you get ground chuck instead. It doesn’t leave as much grease behind. Hope that helps!